About us: Our company trades in watch bands of all kinds of materials. Attractive designs, excellent services, on-time delivery and reasonable price are our main advantages, making our products are better received all over the world. If you have interest in our other products, you can enter our shop and consult our customer service. 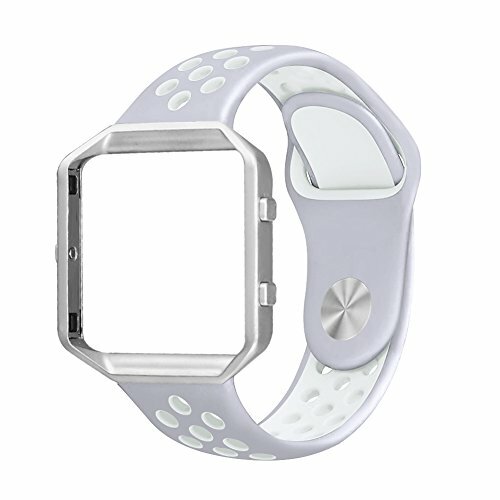 Band color: Pink teal/white black/blue orbitγ blue/black gray/black green/blue pink/fushiaπnk/teal&blue/silver&white/purple&green package content: Only 1 sport silicone strap and 1 frame for fitbit blaze. No tracker or other stuff. Contact us: If you have any problems about the product, click 'umaxget usa store' which is above the color select box. Then you will see a button says 'ask a question', click it and ask whatever you want we would reply it asap. Possible question: 1.Q:Does this have a protective shield over the screen? A:Sorry, it doesn't. It is a casing that holds the blaze in place and protects the edges. 2.Q:Does this band make it waterproof? A:My friend, the band is waterproof. But it can't make your watch waterproof. The band/frame have nothing to do with the actual blaze being waterproof. 3.Q:Is the band already installed on the frame? Can i just pop the blaze in and out easily? That's what i am looking for. A:Sorry, my friend. The band is separate from the frame, but it has easy-slide pins to put it on the frame. Then the blaze pops in and out like normal. If you have any questions about this product by UMAXGET, contact us by completing and submitting the form below. If you are looking for a specif part number, please include it with your message.